This is the back story to the workbook Practical Lean Leadership. Throughout the late 1990s, I wrote several papers about Lean leadership that were published in peer-reviewed, practitioner-oriented academic journals. They were titled: “Continuous Personal Improvement,” “Lean Behaviors,” “Linking Leaders’ Beliefs to Their Behaviors and Competencies,” “Using Value Stream Maps to Improve Leadership,” “Leaders Lost in Transformation,” and “Standardized Work for Executive Leadership.” If you were to purchase these six papers from the publisher, it would cost you $192. Plus, you’d have to wade through the dense academic-style writing, figure out the connections between these papers, and then convert it all into daily practice. This is too much trouble and too time consuming for most leaders to do. So, I decided to do it for them. My idea in 2007 was to produce something more accessible for management practitioners, but at a much lower price. I wanted to create a workbook that would save leaders years of trial-and-error effort. No such workbook on Lean leadership existed. Every book on Lean leadership then, and now, is actually about Lean tools. While it is important for leaders to understand Lean tools and know how to use them, that does not constitute Lean leadership. Finally, it was clear that leaders were struggling to comprehend Lean leadership and the central role that leadership plays in all successful Lean transformations. 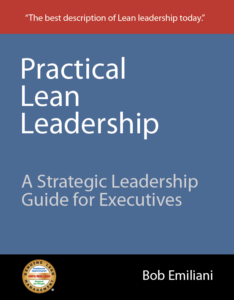 Practical Lean Leadership, published in 2008, consolidates, shortens, and focuses the core concepts and practices presented in my six papers to help leaders transition from conventional leadership to Lean leadership. Plus, it contains chapters explaining what Lean management is, how Lean leaders think, a definition of Lean leadership, fifty errors to avoid (which some readers say that alone was worth the price of the workbook), and a detachable visual control to help people practice Lean leadership. The workbook, printed in color, is only 142 pages, with no chapter having more than 9 pages of text to read. The end of each chapter contains a few pages of self-study exercises. What distinguishes this book is the wonderfully simple approach to Lean leadership, rooted in new contributions to management and leadership literature that were vetted by academics and put into actual use by management practitioners. The workbook is fully consistent with Lean principles and practices in every way, making it very easy to understand and put into practice. Other books try to merge Lean leadership with traditional leadership and organizational behavior concepts and practices that were designed to correct problems in conventionally managed organizations. In my view, this is a big mistake because merging these together confuses, rather than clarifies Lean leadership. It is noteworthy that the most successful Lean practitioners rarely, if every, sought solutions to leadership problems outside the realm of Lean practice. In other words, they did not see traditional leadership and organizational behavior concepts and practices as useful or helpful. Practical Lean Leadership avoids this problem completely. Finally the real lean way… All the best.